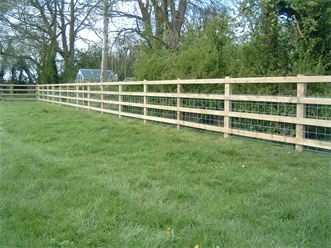 Post and Rail fences are probably the most solid of fences to keep horses in a paddock. Constructed as they are out of 3 inch planks fixed to 4 inch uprights these should be the ultimate fencing system. They are very expensive to install and should last a considerable period. Unfortunately this is not the case as described by a recent communication on our website - "We paid a fortune for a well known local firm to 'properly' fence our new field with post and rail/stock netting - 6 years later it is swaying in the wind. The soil is heavy clay so we thought it would be secure. Unfortunately the horses do not think the same way and are pushing it over. The grass is just as green on this side but they tend to love scratching themselves on the fence. We tried giving them alternate "scratching posts" but that did not alleviate the problem"
A fence has to be remarkably strong to withstand a 500 kilogram horse leaning on it and the posts are bound to give despite being in heavy clay soils. Horses are also known to favour the wood for chewing, cribbing and often to simply jump over the fence - all of which are very difficult to cure. The best solution to this problem and actually improve the effectiveness of the fence as a whole is to add an energised hot wire onto the top of the fence. 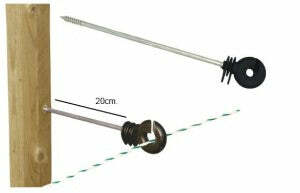 This will be achieved by screwing in an off-set type of insulator on the top rail and threading a conductor through it. 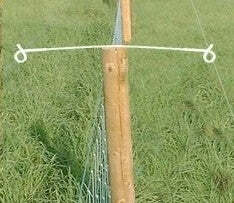 If you need to protect both sides of the post and rail fence then the Flexibarr is a good option. This will provide an attachment to apply a hot wire on both sides of the fence. This solution will prevent a horse scratching itself on the fence AND will prevent them jumping it once they have learnt about it. Normally the addition of a line will be of sufficient attraction to make them investigate the new line and they will get a shock. Should the horse be so accustomed to jumping the fence then another trick may be employed to get them to test the fence. In order to do this it is necessary to attract them to investigate the new addition and get a shock. The best way to achieve this is to bait the fence with a bit of molasses or peanut butter. Evil but highly effective - only needs to be done at the beginning.